High proportion of patients with mesangial proliferative glomerulonephritis (MesGN) is steroid resistant. We report the response of ten children with steroid resistant MesGN treated with intravenous pulse cyclophosphamide (IVCP) together with oral prednisone. All patients were treated with pulse IVCP 500 mg/m 2 per month for six months; oral prednisolone was given concurrently at a dose of 60 mg/m 2 per day for four weeks, then 40 mg/m 2 /per alternate day for another four weeks, which was tapered over the following eight weeks. All the patients were followed up for four years after treatment. All the patients became steroid responsive after the completion of IVCP therapy; nine patients were weaned of steroids and one patient could not. Seven patients showed early response to IVCP; they had no proteinuria after the 2nd dose of IVCP. Three patients had complete remission and never had any relapses over four years of observations. By the end of the observation period, there were six patients who achieved complete remission and they were off steroid, while four patients remained steroid dependent. None of the patients developed any significant side effects. We believe that IVCP is a safe and effective therapeutic modality in children with steroid resistant MesGN. To evaluate the antimicrobial resistance patterns of the Gram-negative organisms isolated from urine culture, we retrospectively analyzed the urine cultures and antibiotic sensitivity tests of inpatients and outpatients in our hospital between 1999 and 2002. A total of 11,659 urine specimens were analyzed of which 2054(17.6%) showed significant growth; 1764 (85.9%) were Gram-negative organisms. The most frequently isolated Gram-negative organisms were Escherichia coli 1026 (58%) and Klebsiella pneumoniae 293 (16.6%). The resistance rates for strains of E. coli isolated from the hospitalized patients were 61% to amoxicillin, 35% to amoxicillin-clavulanate, 47% to trimethoprim, 38% to ciprofloxacin, 31% to cephalexin and 13% to gentamicin. These rates were higher than those from the outpatients (52%, 36%, 40%, 32%, 29% and 5%), respectively. Out of the 42(2%) multidrug resistant E. coli and K. pneumoniae, 23(1%) were found to be positive for extended spectrum beta lactamase (ESBL) including 14 isolates of E. coli and 9 of K. pneumoniae. We conclude that our findings demonstrate a significant increase of resistance to various groups of antimicrobial drugs in the urine culture isolated from both inpatients and outpatients. Management of nutritional status is an integral part of the management of patients with renal disease on maintenance hemodialysis (HD). We investigated whether active nutritional counseling can improve biochemical nutritional parameters and fluid overload problems in patients on HD. A total of 110 patients, on three times per week HD, were enrolled in the study. Information regarding patient characteristics was collected with the help of a questionnaire. Patients with hypoalbuminemia, hyperkalemia, hyperphosphatemia, and more than three kilograms inter-dialytic weight gains were identified and were given active nutritional counseling. The above parameters were followed over a seven-month period. Active nutritional counseling resulted in significant decrease in the prevalence of hyperkalemia as well as high inter-dialytic weight gains (p < 0.001). However, the prevalence of hypoalbuminemia and hyperphosphatemia remained unchanged over the study period. Our study suggests that active nutritional counseling can improve certain important biochemical parameters and fluid overload problems in patients on maintenance HD. Continuous ambulatory peritoneal dialysis (CAPD) is a well established modality for treating patients with end-stage renal disease (ESRD). The placement of a peritoneal dialysis catheter (PDC) is carried out either by the open method or by laparoscopy. The laparoscopic technique offers the major advantage of direct vision aiding placement of the catheter in the proper place and the additional performance of diagnostic laparoscopy. The traditional laparoscopic placement of PDC requires three ports. 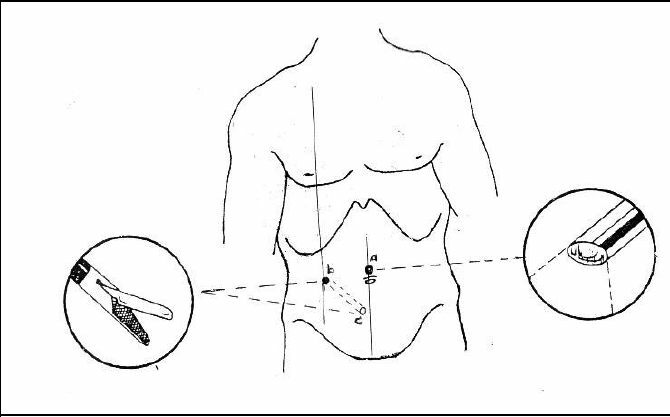 In this study, a two port technique for laparoscopic placement of PDC is described in nine patients. This prospective study was carried out at The Armed Forces Hospital, Khamis Mushayt, Saudi Arabia. Nine patients with ESRD underwent laparoscopic placement of the PDC between January 2001 and May 2002. There were seven females and two males, with a mean age of 52 years (range 38-75 years). The mean operating time was 41 minutes (range 30 -75 min). The mean post-operative hospital stay was 4.5 days (range 2-15 days). Two patients (22.2%) developed leakage of dialysate from the 5 mm-port and one patient (11.1%) had migration of the PDC. Our study suggests that this new modified technique appears to be safe and simple and is associated with rapid post-operative recovery. In this retrospective study, we present our experience on the diagnosis and management of isolated Hydatid disease of the kidneys. Between January 1999 and January 2003, eight patients were diagnosed to have Hydatid disease of the kidney and constituted the subjects of this study. Their age ranged between 20 and 63 years age (mean 40); there were five males and three females. Loin pain was the commonest mode of presentation in these patients. Investigations performed included urine analysis, serological tests, eosinophil count and relevant radiological studies. Urine analysis showed hydatiduria in one patient, the Casoni's test was positive in two, Ghedini skin test was positive in three and eosinophilia was noted in two other patients. All patients were treated surgically using loin supracostal extra-peritoneal approach. Total nephrectomy was performed in five patients, partial nephrectomy in one while excision of the cyst was performed in two patients. Our report suggests that a combination of various investigative modalities with a high index of suspicion is necessary in establishing the correct diagnosis. Surgery remains the main option of treatment for renal hydatid disease. Congenital adrenal hyperplasia is relatively an uncommon condition, and it is considered a rare event to be associated with hypertension on presentation. In this report we describe six patients with growth acceleration and hypertension occurring in early childhood; three patients had hypertensive encephalopathy. The eldest patient in this report is an 18­year old with a genetic female karyotype reared as male. The second and the third patients had skeletal abnormality (short fourth metatarsal), which is a rare combination. The 4th and 5th patients are siblings, a boy and a girl; both of whom had several months of muscle weakness and hypokalemia. The girl had concentric left ventricular hypertrophy and underwent vaginoplasty and clitoral rescission. The sixth patient is an infant with history of neonatal septicemia and convulsions. In all the cases, growth acceleration and features of pseudoprecocious puberty were overlooked. Two patients out of six were reared incorrectly as males. A 61-year-old white man was admitted for evaluation of hematuria. His medical history revealed endoscopic resection of bladder carcinoma 10 years earlier. A diagnosis of relapse of this carcinoma was made. Few months later, he developed low blood pressure and the nephrotic syndrome. Examination of a renal biopsy specimen showed amyloid deposits. Results of immunofluorescence were positive for AA protein. Furthermore, laboratory tests demonstrated suprarenal insufficiency probably due to amyloidosis. 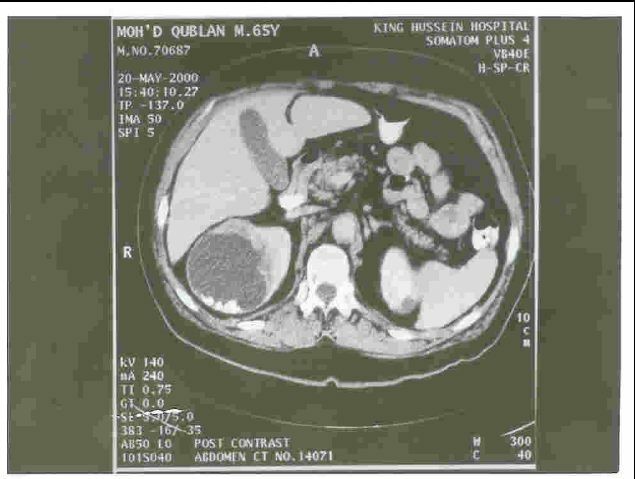 A diagnosis of bladder carcinoma- induced amyloidosis of the kidneys and suprarenal glands was made since no other identifiable cause for AA amyloidosis was found. This is a case report of a 69 year-old African American female with end-stage renal disease secondary to hypertensive nephrosclerosis on chronic ambulatory peritoneal dialysis (CAPD) for five years. Her past was uneventful. She presented with symptoms and signs of acute peritonitis related to CAPD. There was initial response to antibiotics and culture was negative. The condition of the patient deteriorated despite the antibiotic. The peritoneal catheter was removed after five days of starting the antibiotic. The patient died at day seven of presentation due to septic shock and the culture eventually grew Candida lusitaniae, a rare agent of peritonitis in CAPD patients, which was resistant in vitro to amphotericin B. The final diagnosis of renal disease can only be established with the study of renal biopsy using light microscopy, immunohistochemistry and electron microscopy. This study reports on the pattern of glomerulonephritis, diagnosed with light microscopy and immunofluorescence, in two major nephrology referral centers in Sudan. Renal biopsies from 86 consecutive patients were studied by light and immunofluorescence microscopy. The latter was introduced for the first time in the country. Focal and segmental glomerulosclerosis, membranoproliferative glomerulonephritis, minimal change disease and rapidly progressive glomerulonephritis accounted for 26.6%, 22.1%, 10.5% and 3.5% of cases respectively. Lupus nephritis was the commonest cause of secondary glomerulonephritis, accounting for 11.6% of cases. In contrast to the frequency seen in developed countries, IgA nephropathy was uncommon in our series and was seen in only 4.7% of cases. Primary renal amyloidosis was diagnosed in 3.5% of the patients. The pattern of glomerulonephritis in our series is similar to the reports from other developing countries with focal and segmental glomerulosclerosis being the commonest primary glomerulopathy and lupus nephritis, the commonest secondary glomerulopathy. Despite the frequency of sickle cell disease (SCD) in the West African population, the renal changes and outcome associated with it have been poorly characterized. We retrospectively studied 22 renal patients; 19 heterozygous sickle cell trait (AS) and three homozygous (SS) evaluated between 1996-2002. The mean age was 43 years (range from 19-69 years). The observed nephropathies included chronic glomerulonephritis (CGN) in eight (36.3%) cases, advanced chronic renal failure (CRF) in seven (31.8%), chronic tubulointerstitial nephropathy (CTIN) in four cases (18.1%), post-infectious acute glomerulonephritis (AGN) in two(9.1%) cases and pregnancy related nephropathy in one (4.5%) case. Renal biopsy was performed in five (22.7%) patients (three AS and two SS patients); the findings included membranoproliferative glomerulonephritis (MPGN), CTIN, focal and segmental glomerulosclerosis (FSGS) and membranous glomerulonephritis. We conclude that there are various renal abnormalities associated with SCD and optimal management needs early diagnosis and multidisciplinary follow-up. Bangladesh is one of the densely populated countries, a nation of 128 million people, 75% of whom lives in rural areas and the annual per capita gross national product (GNP) is US$ 380.00. The health care budget is 1.2% of GNP and the priority areas are population control, provision of clean drinking water and eradication of communicable diseases. The country has a small number of nephrologists and renal care is available in large cities only. The causes of renal diseases include glomerulonephritis, diabetes, hypertension, nephrolithiasis, obstructive uropathy and interstitial nephropathy. The incidence of end-stage renal disease is not known, but would be much higher than in developed countries because of high incidence of infection and environmental pollution. The treatment of ESRD has low priority in Bangladesh because of the government health policy and high cost of treatment. As a result, less than 10% of ESRD patients are able to maintain dialysis in private hospitals and governmental dialysis centers that are already overcrowded. The vast majority of patients who are started on dialysis die or stop treatment within the first three months. Renal transplantation is not as expensive as dialysis and is less costly in the university hospital than in private hospitals. Cyclosporine is usually replaced by azathioprine after six months of transplantation. 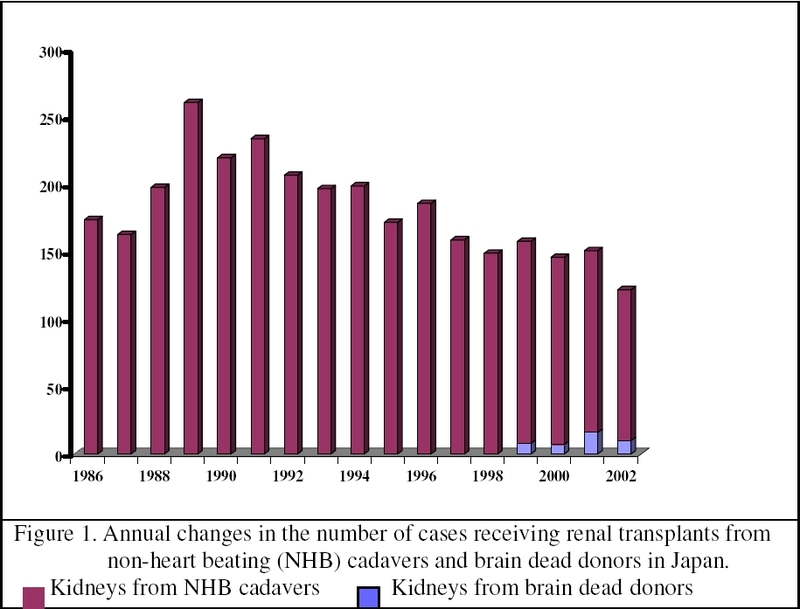 Although organ act law is effective since 1998, cadaveric transplant has not picked up due to lack of infrastructure, facility and orientation regarding cadaveric transplantation. Preventive measures of renal disease can not be overemphasized.